PILSEN — After a weekend full of protests at the former Whittier Elementary School field house, Ald. Danny Solis (25th) hit the pavement Monday to discuss the building's demolition — and persuade neighbors that tearing down the building was the right thing to do. 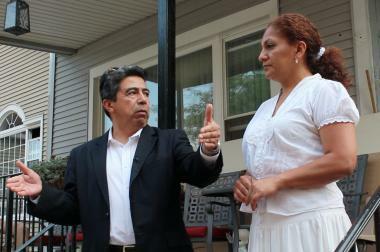 “This had to happen,” said Solis, explaining that safety was his main concern with the more than 40-year-old building. The Whittier Elementary School field house, the scene of a much publicized sit-in in 2010, was demolished Saturday after crews surprised a class of dance students and ordered them out of the building Friday night. Ald. Danny Solis hits the pavement Monday to talk to residents about the demolition of the Whittier Elementary field house. Activists — some of whom participated in the 2010 sit-in that kept the building from being torn down to build a soccer field for a private school — kept a vigil in front of the building known as La Casita from 6 p.m. Friday until the teardown. Though some community members ripped Solis for his absence over the weekend, other neighbors came to his defense Monday. Escobar said many of the protesters who had tried to block the demolition Friday night did not live on the block. “It’s been emphasized, I think when I’ve been walking up and down the street, that most of the people that were chanting and protesting and trying to keep it up were people from outside the community, and that just doesn’t make sense,” said Solis, who said he was made aware of the demolition last Thursday, after returning from a vacation. “People that live here should have a priority in terms of what happens in their neighborhood,” said Solis. But across the street, a 38-year-old lifelong resident who works in the neighborhood said the field house, known as La Casita, had become a symbol of the community — and the way it was demolished was not right. “It’s like the air is being let out of something,” he said. Others over the weekend questioned the timing of Chicago Public Schools. "Why would they do that on a Friday evening?" asked Susana Findley, who taught classes at La Casita. "It's underhanded stuff." Solis said he could understand the “emotional connections” some community members had with the field house. “Again, the key concern for me as the alderman representing this community is the safety of the kids here, and that overrode everything else,” said Solis. CPS said a turf field, playground and two basketball courts would be built over the former field house.